We Brought the Funny! Thank you for Coming! You are here: Home / The Spin / We Brought the Funny! Thank you for Coming! SUCCESS! Thank you for making Comedy on Wheels: Celebrating Canada’s Birthday with Belly Laughs a complete SELL OUT! Showcasing a cast of 16 outstanding community members along with UK-based special guest comic Tanyalee Davis plus the four-piece Comedy on Wheels band, Comedy on Wheels poked fun at Canadian politics, Vancouver transit, and some of the more outrageous yet common misconceptions about disability. Together, we united in laughter, dissolved barriers, and strengthened bonds. 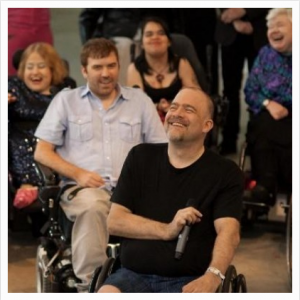 For Comedy on Wheels, we enhanced patron accessibility to a radical new level, providing a venue map, a shuttle, a braille playbill, and ASL and Audio Description at all performances. We extend sincere THANKS to you, our audience, for joining us and for allowing our amazing cast, musicians, and creative / production team to tickle your funny bone! CLICK HERE to see production photos and the complete playbill!